Software developers in Vietnam are considerably more available and affordable than in the United States, Australia, Hong Kong, Singapore and Europe. 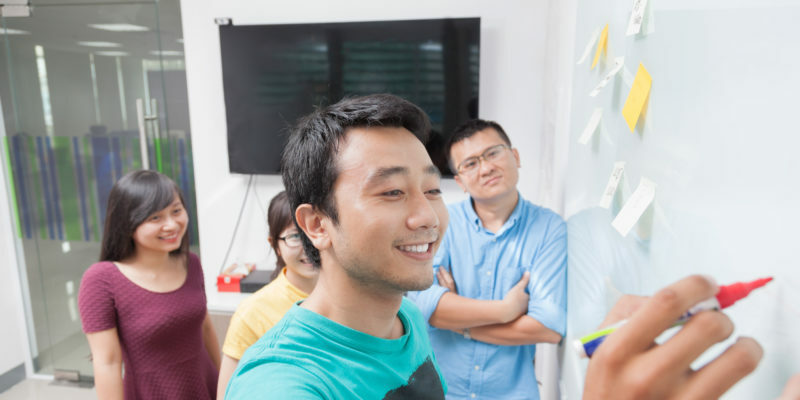 Although Vietnam’s software development industry is large and growing, many foreign entrepreneurs remain unsure of the specific skills that can be found and how easy it will be to recruit software developers in Vietnam. Can We Recruit the Software Developers We Need? We’ve tried to answer the question of availability in Vietnam through analysis of a major database. We’ve used a range of standardized searches to reveal the availability of experienced profiles that match common requirements of companies building software development teams in Vietnam. 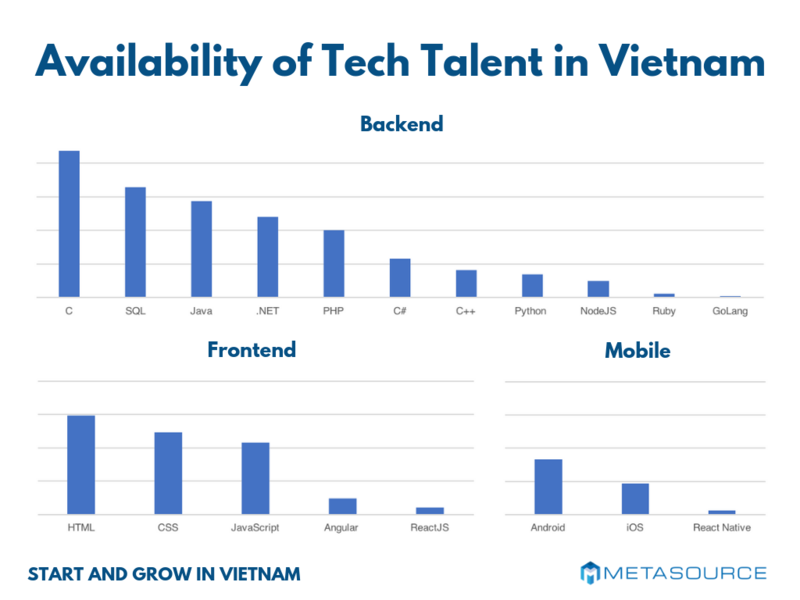 Of course, the absolute number of software developers varies over any given year, but the analysis presented below provides some insight into the relative ease of finding specific types of experienced software developers in Vietnam. Further details on our analysis are included at the bottom of this article (*). We’ve included detailed commentary below on the availability of specific types of software developers in Vietnam, but this is intended as a starting point for discussion. We’ve used a simple scale of abundant > readily available > available > harder to find. C Developers are abundant and typically know other languages. These developers will have knowledge of the C language, standard libraries, data structures and algorithms. C++ Developers are readily available and will have knowledge of OOP, plus the standard library, STL containers, and algorithms. C# Developers are readily available and should have knowledge of data structures and algorithms, SQL databases and ORMs like Entity Framework. Java Developers are abundant. They’ll have knowledge of Core Java Concepts, databases and key protocols. Depending on their focus, Java Developers will have knowledge of EE, EJB and JPA for enterprise software, and web frameworks like Spring and JSF. Knowledge of Tomcat and/or Wildfly is also common. .NET Developers are abundant. There is some variation, but they’ll have knowledge of languages such as C#, Visual Basic .NET and C++ .NET. They should have up-to-date knowledge of .NET frameworks, plus frameworks for web (ASP.NET), desktop (WPF) and communication (WCF). .NET Developers should also have knowledge of IOC containers and ORMs. PHP Developers are abundant. They’ll have knowledge of frameworks like Laravel, Zend, CodeIgniter and/or others. They’ll typically have experience in databases and frontend languages. CMS (including WordPress, Joomla and Drupal) and ecommerce (including Magento and WooCommerce) knowledge is common. For more about PHP Developers, read our detailed commentary. Python Developers are readily available. They’ll have knowledge of Python 2/3, build tools and web frameworks like Django, Flask, Pyramid, and/or others. They will have knowledge of ORMs like SQLAlchemy and/or Django ORM, and test frameworks like py.test or UnitTest. Data scientists or those focusing on machine learning will have knowledge of data analysis tools NumPy, SciPy and/or Pandas, but these profiles are harder to find. Ruby / Ruby on Rails, Perl, Scala and GoLang Developers are harder to find. GoLang is becoming more common. Developers experienced in relational databases (RDBMS) are abundant, including Oracle, SQL, MySQL, PostgreSQL. Developers experienced in non-relational databases (noSQL) are readily available, including MongoDB and Redis. Front End Developers with experience in Angular and/or ReactJS are available. Each year, more developers are growing their skills in these areas and supply should increase significantly. Android Mobile Developers are readily available. Android Developers should have knowledge of Java, XML, the Android SDK and Android Studio / Eclipse. They’ll have knowledge of Material Design and be able to work with JSON and RESTful APIs. They should also have experience in various databases. iOS Mobile Developers are readily available. iOS Developers should have knowledge of Swift and/or Objective-C, plus core iOS libraries and frameworks like Core Data and Core Animation. They’ll have knowledge of Apple’s design principles and interface guidelines. They’ll be able to interact with APIs. Developers with expertise in React Native and/or Ionic are harder to find. Each year, more developers are growing their skills in this area and supply should increase significantly. The availability of software developers in Vietnam is relatively strong compared to other countries, especially after Lunar New Year. Of course, availability declines as technical requirements, budget restrictions or operational considerations are added. Amongst the common requirements, availability can be most limited for Ruby, GoLang and some specific CMS or e-commerce platforms. However, most ‘profiles’ can be found in Vietnam with adequate budget and time, even for technical skill sets with limited availability. The majority of recruitment situations are resolved at a much faster pace and considerably lower cost than can be expected in countries like the United States or Australia. If your project is struggling to find the resources you need at home, maybe its time to consider an offshore software development team. You might also be interested in this post on software developer salaries in Vietnam if you’re preparing to recruit. * This research is intended to provide a general picture of availability of software developers in Vietnam. We’ve focused on just one of several commercially-available databases and used standardized search queries to identify suitable profiles of experienced software developers (>2 years) who were actively seeking new opportunities. It’s food for thought!